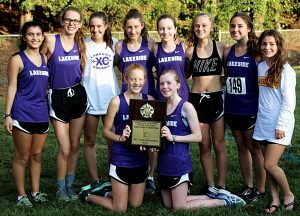 New champions were crowned at the 2017 DCSD JV Cross Country County Championships as Lakeside and Dunwoody traded titles from a year ago. The Lakeside Lady Vikings ended the six-year reign of the Dunwoody Lady Wildcats coming up one-point shy of a perfect score of 15 in a 16-54 victory over the defending champions. Chamblee was third with 82 points followed by Southwest DeKalb (115), Druid Hills (123) and Redan (143). 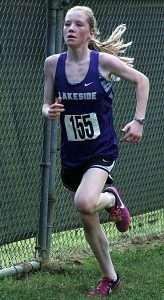 Eighth graders ruled for Lakeside as Abigail McHoul won the individual title with a time of 14:13.90 almost 15 seconds ahead of fellow eighth grader and teammate Kate Van Horn (14:28.80). Freshman Natalie Hanson of Lakeside was third in 15:33.30 and sophomore Lena Ayoub was fourth (15:42.80) as the Lady Vikings swept the top four spots. Lakeside had all seven runners finish in the Top 10 with 10th grader Maddy Cora was sixth (15:48.90) with freshmen Rachel Doran (16:09.90) and Hannah Baniassad (16:15.20) finishing eighth and ninth, respectively. Dunwoody had a pair of Top 10 finishers in sophomore Claire Porcher (15:44.00) in fifth and freshman Sarah Rudder (16:07.60) in seventh to aid the second place finish. Chamblee freshman Stephanie Lynch ran a 16:19.80 to get into the Top 10 for the third place Lady Bulldogs. 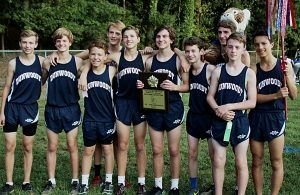 Five Top 10 finishers paved the way for the Dunwoody Wildcats to knock off reigning champions Lakeside Vikings 30-57 to become the 2017 DCSD JV Boys’ Cross County champions. Druid Hills (112) was third followed closely by Clarkston (114) with Martin Luther King Jr. (138) in third. Stone Mountain (143) was fourth ahead of Chamblee (156), Southwest DeKalb (167) and Redan (259). Dunwoody freshman Conner Reid got the Wildcats rolling with his third place finish in 12:30.50 ahead of sophomore teammates Carson Bregitzer (12:42.10) in fourth and Matt Beiger (12:50.80) in fifth. Eighth grader Jack Wichman (12:49.10 was eighth overall and freshman Aidan Chen (13:12.30) was 10th. 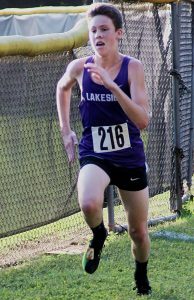 Lakeside’s second place finish was boosted by sophomore Ethan Gregory who broke 12 minutes with a time of 11:56.30 as he ran away from the pack for a 30.5 seconds victory. Freshman Mason Mihalis (12:49.10) was seventh and sophomore Chas Broughman (13:06.40). Martin Luther King’s Zar Anderson-Brown grabbed the silver medal in the boys’ race with a time of 12:26.80 to pull the Lions into a fifth place finish in the team standings. Stone Mountain sophomore Cameron Burse took sixth overall with his time of 12:51.90, just 1.1 seconds behind Dunwoody’s Beiger.